After playing the game for about a week now, I decided to do a semi-review and give you my thoughts on the game so far. I'll try to answer two big questions here: is it a good sequel, and is the game fun overall? Warning: Since this game requires you to have played the first game to fully appreciate it, there will be a few spoilers from Tales of Xillia 1. Creating a direct story sequel for a JRPG is a very tricky thing to do. Most games have a story that is perfectly fine standing on its own, and you wouldn't expect the writers to have a plan for a second or third game. There are cases in which the developers clearly had a bigger scope in mind and designed the game's stories accordingly, like in the case of .hack or Golden Sun. But what if a game suddenly sells so good that a sequel is being made, yet the story feels like it had a proper ending and doesn't need a sequel? Usually in JRPGs, you save the world at the end, but what happens to the world afterwards? How will it develop now that it is no longer threatened to be destroyed? Xillia 1 had a rather brief glimpse of the future, only saying that 1. the world will live on and 2. the heroes will find a place/job in the new world. No big details whatsoever. Fortunately, Xillia 2 gives us a proper look at the future that was hinted at. Just like in Final Fantasy X-2, the portrayed world is progressing naturally, you can totally understand and relate the developments that have happened between the two games. What's more, the sequel gives us a proper look at Elympios. In Xillia 1, the place consisted of only one town, two dungeons (one of which was optional) and two roads, and that's it. In Xillia 2, there's a LOT more be seen, not just locations but also characters and culture. All of this is shown to us through the eyes of a (almost) silent protagonist. Yes, you heard that right, a (almost) silent protagonist in a Tales game. Ludger Kresnik is a man who rarely speaks full sentences. He's yelling his attacks in combat just fine, and occasionally replies with a "What?" or "Yeah" in conversations. But most of this dialogue is not voiced, as it is chosen by you, the player. Yes you heard that right, multiple-choice dialogue in a Tales game. This is done to give the player a sense of individualism obviously, but it works well here as none of the answers feel forced or out-of-character for Ludger. In fact, even though he doesn't speak casually even in skits, you can still learn plenty of details about his character. You're being given two choices at key moments during a conversation. 90% of the time you can think as long as you want about your answer, but there are a few moments where you have to decide within 6 seconds or so. The available options are quite varied and offer a great deal of personalization. Since the outcome is more or less the same (I have yet to encounter a Game Over from a bad choice), it comes down to the personal touch of you, the player. Xillia 2 may have finally gotten the balance between linear storytelling and player choice right... in a JRPG at least. In terms of gameplay, Tales of Xillia 2 improves upon the standard formula once again. 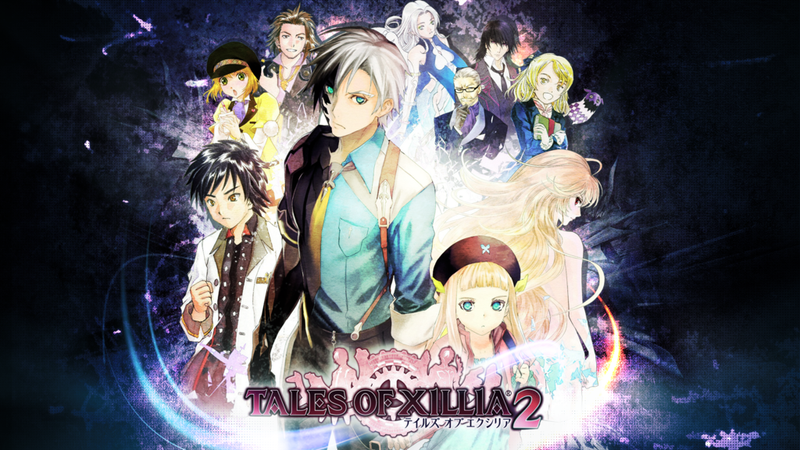 The first Xillia did some rather drastic changes from the standard Tales formula: No more puzzles and overall smaller dungeons, no world map and instead traveling from one area to the next like in Final Fantasy X, a level-up system that has an optional autolevel option, and no more cooking and minigames (but still crafting of sorts). While some fans may not be all that happy about this, personally I think it was the right thing to do. As someone who's played JRPGs for a long time, having a game that is pure story, combat and a bit of exploration is just the perfect thing for me. It also makes replaying through the entire game less frustrating, as you don't have to do the same puzzles all over again. Xillia 2 carries over all of the changes from the first game, and adds a few nice touches of its own. The biggest difference is how the game handles story progression: The game is divided into chapters, and you can start a chapter by talking to a specific NPC at any time. You can travel all around the world in-between chapters, meaning that you're in complete control whether you want to explore a new area and train some more, or go forward with the story and be restricted to your choice of locations. The same goes for the sidequests which focus on each of the main characters. The game's map even points it out if there is a new side chapter available. If you're short on money (and trust me, you will be), there's a job board that offers monster hunts and item deliveries with decent money rewards. There also are elite monsters which essentially are gigantos monsters from Tales of Vesperia, complete with their signature combat theme. They're quite challenging, but NPCs also give you some strategic tips on how to defeat them. If you thought the main storyline bosses were to easy, these will give you a run for your money - and in return give you a hefty reward if you can defeat them. Last but not least, there's Amazon Kitty. Yes, you read that right. Goats aren't the only animals Amazon uses in Japan nowadays (you'll understand once you play the game yourself). Overall, Tales of Xillia 2 is a joy to play. I only played the game for about 35 hours so far, but unless it screws up really bad towards the end, the rest of the game should be as good as the potion I've played so far. It's a satisfying sequel, and everyone who's played the first game should play this one as well. Yes, you read that right, it's the end of the article. See ya!